The deets: J.Crew Factory skirt and top (similar); Ray-Ban sunnies (prescription); Lancome "Pretty Burgundy" lipstick; necklace c/o My Jewel Candy; Rebecca Minkoff bag; Fornash bangle; ALDO heels; OPI "Big Apple Red" nails; earrings c/o Giando Massi (now 68% off! ); Michael Kors watch. If I have a lipstick shade that perfectly matches something I am wearing, I can't help but wear it. Be honest with me, is this a mom thing? I can't tell but I likes it. Also - how pretty are all the leaves finally falling to the ground? It's starting to look a lot like fall around here which has me SUPER excited about the apple picking trip I have planned for this weekend (even though it's only Monday). Bring it on! I love the wine skirt and the lipstick is perfect! Such a gorgeous shade! Fabulous color matching! Love the darker lip color for the fall! You are just such a beauty! 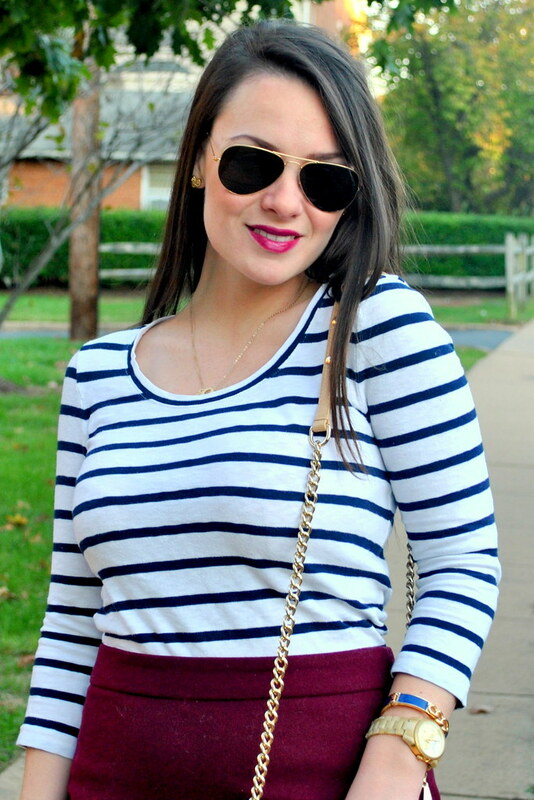 This skirt is perfection on you! Great pairing, love the maroon color. Love your classy style. Your lipstick looks great with the whole outfit too. 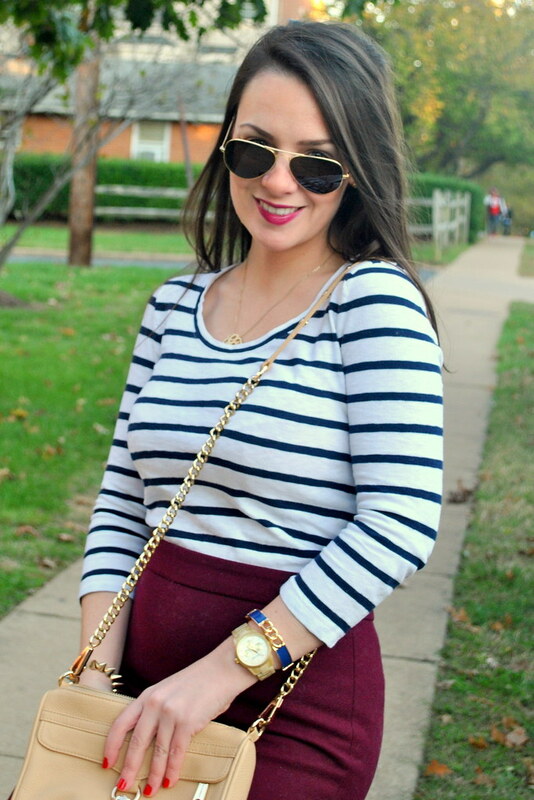 love this look - perfect for fall! The skirt is wonderful. Great cut. Pencil skirts always rock. Great color. Burgundy is just special all on its own. The lips are a perfect match, too... and, "no", I don't think it is just a "mom thing."